If you want to impress your colleagues with your old-school GDC knowledge, be sure to work in how the 25th GDC will not be the 25th year of GDC. It worked like this. 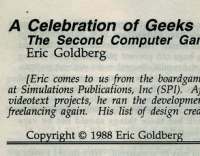 When the first GDC was organized, it was held at Chris Crawford's home in 1988. It was such a wild success, that a second GDC was put together and held at a hotel in the same year, with a panel/session format that has held to the present day. I wasn't there, but thanks to contributed items, I can have an idea of what went on. You can view the article as a pdf file (4.3mb) or browse the images on the GDC Flickr stream. You can also click on individual thumbnails to get an idea of the article's writing. The article is effusive in tone, happy that the whole event came off with few hitches and pleased at the amount of support shown by the 150+ attendees on the need for a conference focused on game design and issues related specifically to designers. The keynote was the legendary Dani Bunten, creator of M.U.L.E. and Seven Cities of Gold, who gave this advice: Start a family, raise children. Grow as a person and learn from your family what people want from games and how games can best serve the needs of adults and children. Bunten, ultimately, wanted to say that being a nerd or a geek was nothing to be ashamed of, and the assembled attendees could feel pride in their accomplishments and talents. "The attendees at the symposium were overwhelmingly male, and often could not figure out how to deal with the few females who make computer game design their business... Bunten rescued us from terminal Neanderthal status by asking the women in the audience to comment on how they thought computers could support true popular multi-player games -- and studiously ignored the men champing at the bit to be heard until a representative sampling of women had spoken on the question." How are we all doing on that? In fact, Goldberg has a range of concerns which he discusses, all of which have had to be addressed at later GDCs (and other conferences, for that matter). For example, awards given were to companies and not individuals, because "there was a strong sentiment that these had far too much potential for creating animosity, and also that giving awards to each other was somewhat unseemly." "The chief bone of contention was the role of publishers in future conferences. A vocal group of developers felt that the publishers, with their greater resources and as the source of the developer's livelihood, would disenfranchise the free-lance developer in what's supposed to be a forum of his peers - but not if the publishers were somehow kept out." "After the first conference, at which 27 people were present, Crawford hoped the next one would attract 60. His guess was low, by 120 attendees. Estimates for the next time around range from 250 to 300; the chief worry expressed by long-time designers was that even more will come." Other sections discuss specific seminars, the growing pains of designers coming into their own, and where the industry might be heading based on what was being discussed at this, the second GDC. The article is, ultimately, a great on-the-ground report of the goings on at the conference, and one I hope will be augmented with other stories. Feel free to tell them via e-mail or comments.